Come on Boulder, if you want to discourage me it is going to take more than “an infectious disease, which was once referred to as ‘The Black Death’.” With or without The Black Death, I still get 65 degree sunny morning mountain-top views, local-raised-and-farmed-organic-free-range-grass-fed-gluten-free-macrobiotic-vegan-and-or-vegetarian-freshly-prepared-food options every corner, and a community of outdoors-loving, progressive-minded, well-traveled, well-educated, healthy and happy fitness enthusiasts. I’m not saying that I want to ooze puss and blood from buboes in my neck and groin but I understand that there are always compromises to make in choosing where to live. And if that’s the trade-off for living in Boulder, it doesn’t seem entirely unreasonable. 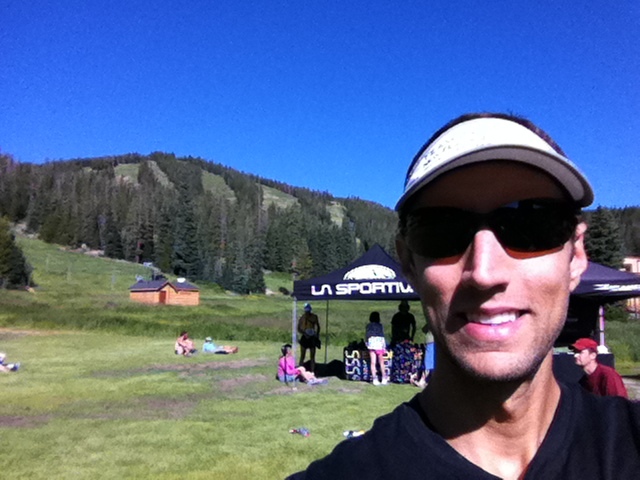 This week I’ve had a chance to hit the trails with about 25 different runners over the course of 7 runs. Without exception, everyone has been encouraging, complimentary, and eager to share our own stories about running and the rest of life. The caliber of runner has been, at times, a bit intimidating. Of the ~25 runners, I am THE ONLY ONE who didn’t run competitively in college. A number of them are current college runners. And at least a few are in training for the Olympic trials. I didn’t find out until after our run yesterday that one guy (Peter Hegelbach) I had been talking with about my marathon aspirations had won the Bronze Medal in the 2005 World Championships in the 1500m. But terms like State Championships, Course Record Holders, Olympic Trials Qualifiers, and Marathon Winners have been commonplace enough in the daily running conversations that I’m almost getting used to it. One correction as I re-read the last paragraph. There was one guy who I don’t think ran in college, a staggeringly humble guy named David Roche. If I got the details right, cobbled together from what I could draw out of him and the stories relayed to me from others we ran with, Dave didn’t really focus on running at all in high school but still made it to the state championship (incidentally as the only white guy in the state, the legend goes) with a 10.6 second 100m. I heard that one of his recent workouts included 12 X 400m at 61 seconds each. I ran a 10K race this past Saturday, running well even on the uphills, sprinting the downhills, and generally proud of how well I got through it despite being at 10,000 feet. It took me 54 minutes, good for 44th place out of 169 finishers. David won the race, in 39 minutes, and afterwards had little to say about the race other than what a good job I did. If he wasn’t so genuinely nice it would have seemed condescending. But that’s how I’ve found the runners to be here – full of support for one another and easy with the compliments. The first week here was more mileage than intensity, other than the 10k race. Most miles have been at conversational pace but a 9-miler, 20-miler, 10k race, and 10-miler, all at altitude with lots of mountain trail, in 5 days, will hopefully be as good for my marathon training as the more conventional speed work. And, yeah, there has been a lot of wonderfulness in my Boulder experience that has little or nothing to do with running. 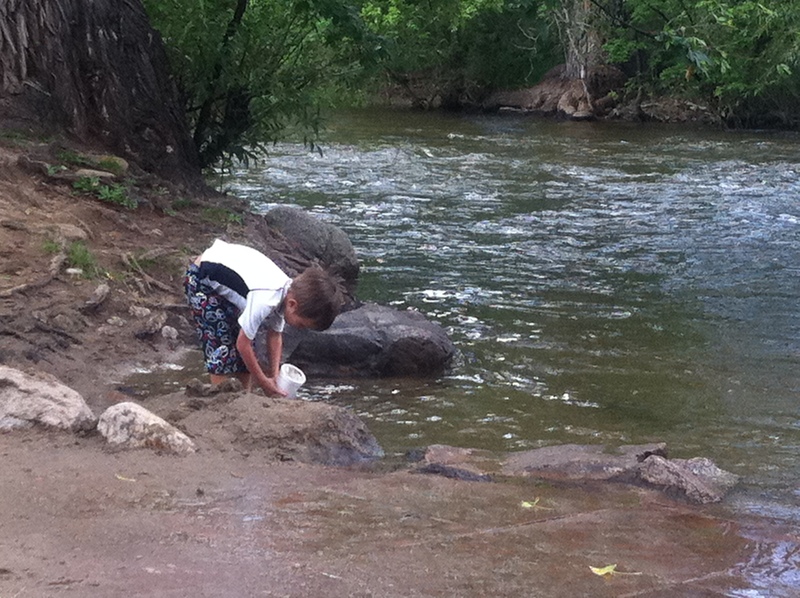 Parks and splash time in the creek with Sagan, great family meals and hikes, visits with the Pfaffs, Simpsons, and Solleys, all friends who have already made the move to spots along the front range, and highlights of quintessentially Boulder-area experiences like the Farmer’s Market, the County Fair, Pearl Street, coffee shops, and restaurants including my new favorite, Sherpas, which is run by, yes, real Sherpas. Still on tap: Red Rocks, Estes Park, Rocky Mountain National Park, and lots of time in, on, and over dirt, rocks, roots, and leaves. The plague warning is HILARIOUS! 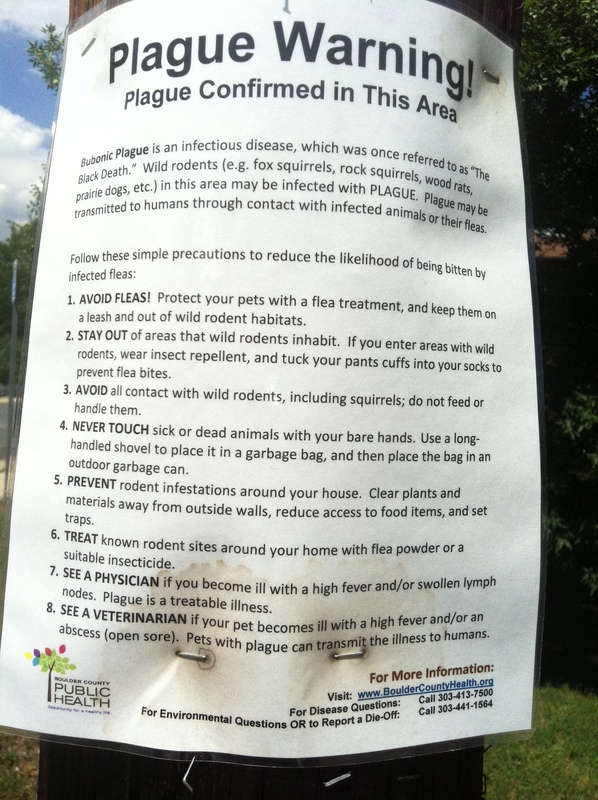 “Avoid fleas.” Yeah, we will try to do that. “Stay out of areas that rodents inhabit.” Check. “Never touch sick or dead animals with your bare hands.” Darn, and I was having so much fun rubbing my hands all over dead things. “Prevent rodent infestations around your house.” Really? I’m glad they told me. MDR, you are a great writer! Your posts are both informative and entertaining.